The world’s media is talking of a fresh defeat for Russia: that NATO, having overcome Russian resistance, is once again expanding in the Balkans, welcoming Macedonia into its ranks. In a fairytale ending, of all the 29 NATO members, Greece—with which there were the most problems in this story—will symbolically sign the entry protocol first. Amid this idyllic scene, Russia has been left to play the role of the evil fairy godmother who tried to ruin the celebration for everyone out of pure spite, but failed miserably. And just like in a fairytale, the happy ending for Macedonia and NATO was obvious right from the start. Yet Russia still elected to take an invariably doomed position. This episode shows that confronting the West has become an intrinsic value for Russia, regardless of the outcome. If there is a chance to make a point, then it should be used, even if making that stand is pointless, will only frustrate everyone, and will harm Russia’s own interests. In true Dostoyevsky style, the more hopeless the endeavor, the sweeter the self-inflicted defeat. Ten years ago, when Albania and Croatia joined NATO without any particular Russian involvement, few could have thought that it would be any different with Macedonia. Russia has never had any particular interests or levers of influence there. But in 2014, the Ukraine crisis broke out, severely damaging Russia’s relations with the West, and in 2015, there were mass protests in Macedonia against the government of then prime minister Nikola Gruevski. This coincidence was enough for Moscow to bring up its favorite topic of color revolutions and describe the protests as meddling by foreign powers. 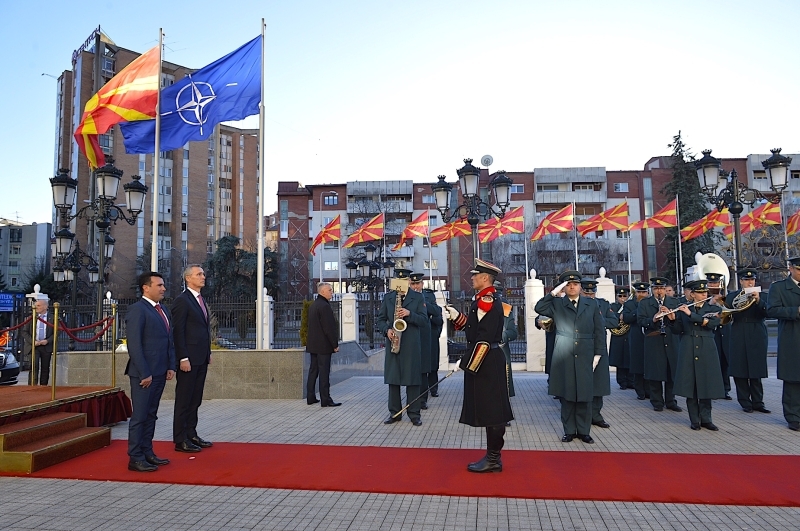 The fact that the EU had for years praised Gruevski as a pro-Western reformer did not discourage the Russian leadership, nor did the fact that the Macedonian premier and his VMRO-DPMNE party were staunch supporters of the country joining NATO. Naturally, in the case of distant Macedonia, there was no question of emergency loans or special operations, or even of refuge for Gruevski in Russia like that given to ousted Ukrainian president Viktor Yanukovych. But none of this was necessary in the tense atmosphere charged by the Ukrainian crisis and election of Donald Trump in the United States. Critical statements by the Russian Ministry of Foreign Affairs, damning publications in state-owned Russian media, suspicious activity on social media, and a visit to the Kremlin by Macedonian President Gjorge Ivanov—who is close to Gruevski—were all enough to convince the West of large-scale Russian interference in Macedonia aimed at changing the country’s geopolitical orientation. After that, there was no turning back the tide. The West mobilized to help Macedonia’s new ruling coalition of Social Democrats and ethnic Albanian minority parties not only to come to power, but to demonstrate progress in integrating with NATO and the EU. Russia, deeply allergic to any expansion of NATO, was forced to focus on the final conflict obstructing the integration of Macedonia into those two bodies: the dispute with Greece over Macedonia’s name. While the West put all its efforts into mediation between Greece and Macedonia in that dispute, Russia chose a tactic that did not even theoretically allow for the possibility of success. Moscow effectively suggested to both countries that they do nothing and simply wait until the issue became less sensitive, as if the preceding twenty-seven years hadn’t been enough. The Prespa agreement on changing Macedonia’s name to North Macedonia was signed by the governments of both Greece and Macedonia. Yet Russia still continued to criticize the deal as unacceptable, on the basis that it angered nationalists in both countries. There were, in fact, many fair points in Russia’s criticism, and an agreement was only reached thanks to strong pressure from the West. The deal was supported by more than 90 percent of voters in a non-binding referendum in Macedonia, but turnout was just 38 percent, rather than the 50 percent required for a valid result. The wording of the referendum was clearly manipulative: there was no mention of the name change, but joining the EU and NATO was promised on condition of approving the deal. To get the required number of votes in the Macedonian parliament, the government was forced to amnesty opposition politicians accused of storming the legislature in 2017. It fell to the speaker of parliament to sign the law amending the constitution to rename the country, after President Ivanov refused to do so. Macedonia is a parliamentary republic, so in the end, all the formalities were observed, but the process was hardly akin to a genuine reconciliation between nations. Even in Greece, where a simple majority in parliament was enough to approve the deal, voting on the agreement led to the collapse of the ruling coalition. Amid so many complications, the settlement could have foundered many times and slipped down the West’s list of priorities—if it hadn’t been for the stubborn criticism coming from Russia. Moscow’s ostentatious hostility meant the West blamed any difficulties over Macedonia on Kremlin machinations, and it resolved not to give up under any circumstances, because the stakes had suddenly grown from a small peripheral Balkans state to defeat in the geopolitical standoff with Russia. And it was Russia that raised these stakes. Furthermore, it’s really not clear what long-term success would have looked like for Russia. Macedonia needed the deal to realize its long-held dream of joining the EU and NATO, while Greece needed it to safeguard itself from growing Turkish influence to its north, in Macedonia. In both cases, these are non-partisan priorities that would not have disappeared with a regime change. By supporting opponents of the agreement, Moscow has got drawn into the domestic politics of both countries, and has aligned itself not only with one side, but with a side that would no longer have had any use for Russian help once it was in power anyway: politicians in both Greece and Macedonia only need to criticize the agreement as a way of coming to power. Then the new leaders will happily write off unpopular decisions as the legacy of their predecessors, and will be only too glad to live in a more comfortable reality. The results of Russia’s involvement in the Macedonian settlement are woeful. Greece, which didn’t expel any Russian diplomats even after the international scandal that followed the poisoning of former Russian spy Sergei Skripal, has now expelled two. The Macedonian government sees Russia as an enemy, while the Macedonian opposition has no intention of orienting itself on Moscow, and continues to support Macedonia’s entry into NATO. The country will join the alliance far more quickly than people there could ever have dreamt not so long ago. All of this has turned into yet another source of irritation in the already fraught relations between Russia and the West. Russia’s attempt to resist the inevitable has only hastened its advance, while adding a dash of international humiliation for Russia and damaging its interests in the region. This article was originally published on www.carnegie.ru.